A Bittersweet Reunion . . . 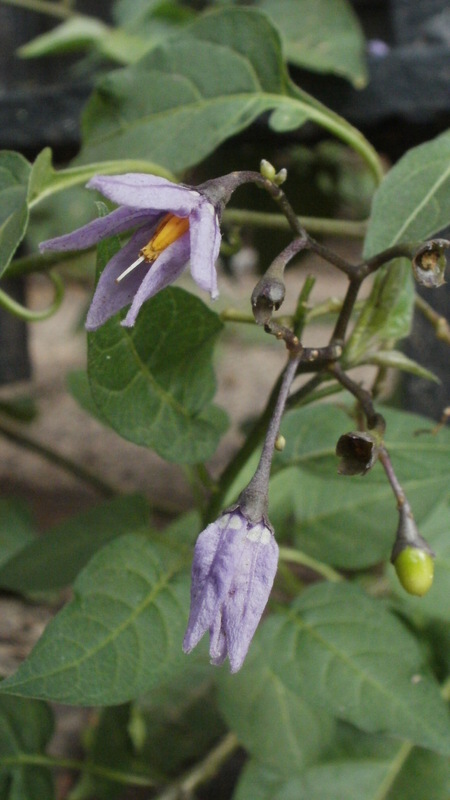 The Common Nightshade was profiled in Wildflowers of the West Village during July when the plant began to flower throughout the area. 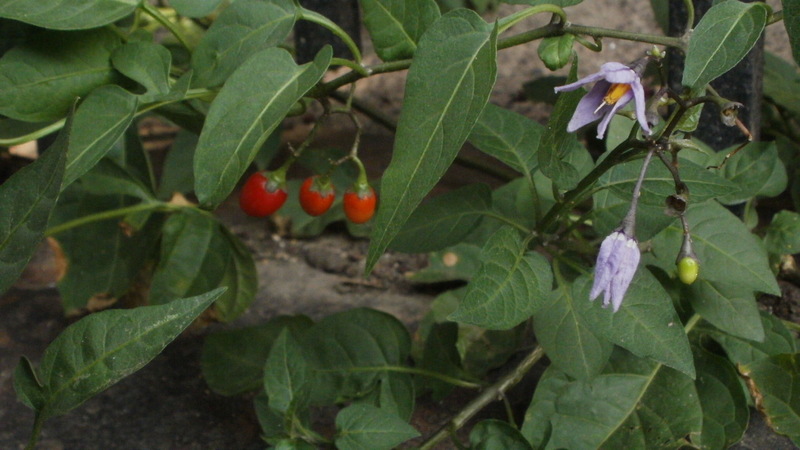 This variety of Solanaceae continues to thrive in the neighborhood’s tree pits and along the edges of construction sites even now that autumn has arrived. I had mentioned the role the Nightshade played in my youth; its fruit being ammunition for berry battles that resulted in stained clothes. One detail I did not relate was that the variety we most often encountered in the weedy lots and hillsides of our Pittsburgh neighborhood had purple flowers and red berries, not the white blooms and purple fruit of the Common Nightshade. This is the variety of the genus Solanum I remember from my boyhood. The plant reveals the connection to its family in a way that fuses aspects of its cousins the potato and the tomato. This Nightshade, an herbaceous perennial, grows as a vine of distended, heart-shaped leaves like the former and its fruit is ovoid and red like the latter, only rendered in the size of a costume pearl. The flower is an attractive star of five purple petals with a projecting golden stamen; a distinctive blossom, and beautiful, displayed in hanging clusters. Like several of the other Wildflowers of the West Village, this one has had a reoccurring part in my background, the stage setting where my broader outdoor experiences have played out. A few years ago, during a long bike ride in Philadelphia, I paused beside the Schuylkill River and sat in the grass for a rest. I noticed a Bittersweet in bloom along the bush line nearby and took a few moments to compose a quick drawing of the scene in my travel sketchbook. A passing moment, a bit of natural color, committed to memory through art; a short newsreel of my life experience retained, in part, because of a wildflower. 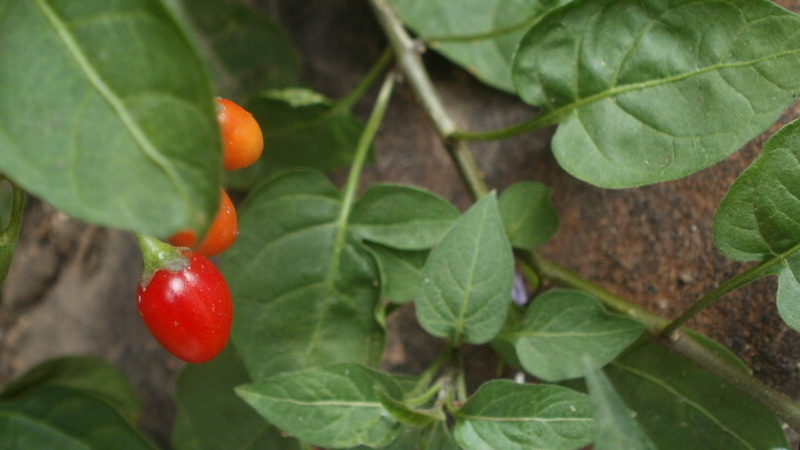 Bittersweet, like most members of the Nightshade family, is poisonous and should be admired only for its aesthetics. This native of Europe and Asia is an attractive ground cover, can be trained to wrap and coil around trees and fences, and would make a complementary color companion to the purple morning glories now showing their flowered faces all throughout New York City.